Scooper - Technology News: Working parents: our jobs are flexible, so why can’t our childcare be? Working parents: our jobs are flexible, so why can’t our childcare be? Say “infrastructure” and you might think of roads. Or perhaps pipes. Pipes carrying water, gas, electricity. Buses carrying commuters to work. Cables, concrete, bridges, tunnels. There’s another kind of infrastructure, though, which is equally essential. It’s infrastructure that is fundamental to the rest of the economy. In particular, it’s critical to enable the economic participation of women. It’s childcare infrastructure: the formal paid systems or loose family networks that allow women at the peak of their economic and fertile capacity to work. Without childcare infrastructure, half the populace is effectively prevented from full participation in economic, social and public life. A recent OECD study highlighted the countries in which childcare is particularly costly. My own country, the United Kingdom, was at the top. 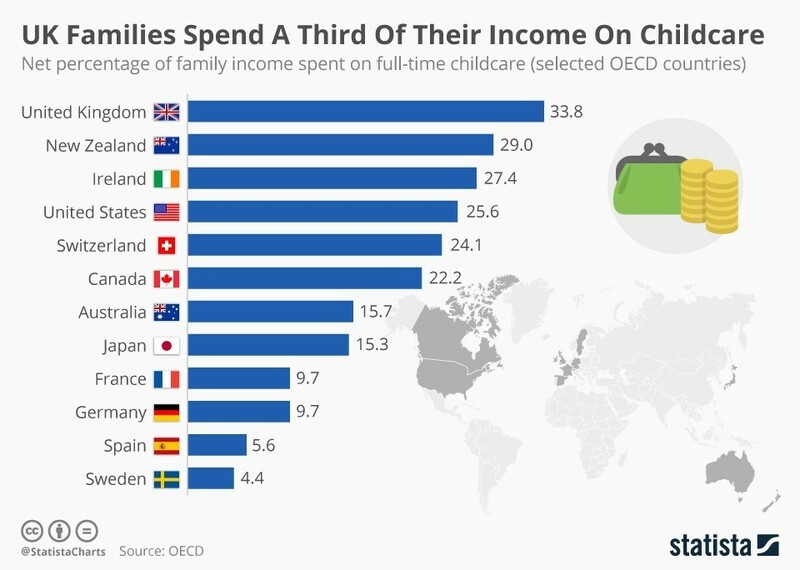 My countryfolk and I spend, on average, a full third of our family income on childcare. That’s in a country where housing is also historically expensive in real terms, so it’s not as though we have piles of disposable income gathering dust. Given the financial pressures, it is little wonder that many women in the UK do not go back to work after having children – not out of choice, but necessity. In one recent British study , 67% of mums in work said the cost of childcare prevented them working more. This underpins long term inequity: for each year a mother is absent from the workplace, her future wages fall by 4% . Recently, a British friend of mine bemoaned that after paying her nanny, she had just £300 pounds per month for anything else. Paid work in such circumstances is basically a time-consuming hobby. Unfortunately, this isn’t only a problem in the UK. Across the developed world, there is little money in the tin in those countries that subsidise heavily, especially as demands from older generations (for healthcare and pensions, for example) increase. This isn’t the only factor that’s going to make childcare even harder to manage, however. The very nature of work itself is changing, making everyone’s arrangements more complicated. Working parents are more likely to freelance now, to work “gigs” rather than jobs, to have part-time and casual arrangements, to work with teams in other countries, and therefore keep odd hours. The Fourth Industrial Revolution is going to stretch our childcare infrastructure even thinner than it currently is. That’s because it’s even harder to find good childcare to cover this work. Existing infrastructure, such as nurseries, is not set up to cater for changing hours, or often even for part timers. The problems are structural: in many countries, government regulates adult/child staffing ratios, and it’s extremely difficult for nurseries to cope with “spikes” in demand. If five children turn up unexpectedly, the nursery might need an extra two staff to keep within their legal adult/child ratios. If they operate outside of those ratios for a single minute, they risk getting their licence removed. But if they overstaff during slow periods, just in case the five children turn up, they risk bankrupting themselves. This rigidity, combined with wafer-thin profit margins, makes it extremely hard for nurseries to ever respond to ad hoc need for childcare. Government subsidies could of course help to keep nurseries open longer and ensure quality is maintained. In some countries, that’s exactly what happens. But is this the only solution? I think there is room to innovate. We could think differently about our childcare infrastructure, especially about how we can use technology to achieve utilization efficiencies. One idea being developed in the United Kingdom is to optimize nanny capacity by helping multiple parents collaborate as joint employers of a single nanny, who then cares for multiple families’ children at once while working between the parents’ homes. Another idea for “on demand” childcare uses parents’ online social graph – their Facebook friends and friends-of-friends – to create trusted networks of carers. A raft of start-ups are working on apps and other forms of technologies that aim to deliver early years education at scale. All of these initiatives want to get more out of less – doing what we’ve achieved in other industries on a grand scale in the past decade. The Fourth Industrial Revolution will demand it. We need to keep iterating and learning from these new models, ensuring that our critical childcare infrastructure flexes, bends and evolves to cope with the new world of work. The author is a member of the World Economic Forum’s Young Global Leaders Community , a network of exceptional leaders from all walks of life who operate as a force for good to overcome barriers that stand in the way of progress.